The mission of the San Rafael High School Garden Project is to inspire and educate students about the nutritional and environmental benefits of growing and eating organic fruits and vegetables. Planning for the garden started in the Fall of 2007. It began as a joint project of the Health Club and the Branching Out Club, our schools nutrition and environmental clubs. As the advisor of both clubs I took on the task of supporting a motivated group of students to achieve their goal of creating the organic vegetable and native plants garden on our campus. This year the Health and Biology classes will use the garden as an outdoor learning lab. 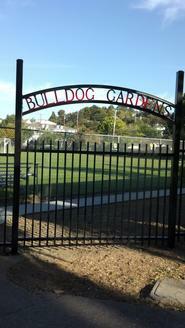 If you would like to be on our volunteer email list or help out in the garden send me an email at makpinar@srcs.org. This Fall Physics Academy teacher's Bob Holt and Steve Temple worked tirelessly with their students to create an irrigation system for the Organic Garden. The new system is part of a greater movement towards turning the garden into an outdoor Sustainable Living Lab and is funded through a grant from P.G.and E. The student are designing a computer program that will be able to sense when the soil moisture is low and automatically water each bed accordingly. They are also installing a water catchment system so that we can collect and use the rain water coming off of the roof of the science building. In addition to masterminding the system Mr. Holt's 5th period class also did the grunt worked required to install it. They supplied both the brains and brawn!!! What a crew! Thank you for your hard work!!!!! For more information on this project check out the Sustainable Living Lab bog. Thank you Skylar and Pat Collins and the other boy scouts and troupe dads for our new shed! This Fall, former SRHS student Skylar Collins built a shed for the Organic Garden as his Eagle Scout project. With the help of his Dad and his entire troupe he designed and built a beautiful shed. Skylar got a grant from the SRHS alumni association for the material. We are so thankful to both the Boy Scouts and the alumni association for our new shed. Not only is it beautiful, but we do not know what we would do without it.